What a great continuation of the series! You often times wonder if the events that are happening to and around you are signs of greater things, and that is what Maris goes through. Everything that seems to happen to her and the decisions she has to make for her future would leave anyone second-guessing themselves. A fast-paced read for your next weekend getaway! It’s finally here . 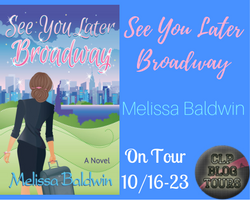 . .
the much-anticipated sequel to See You Soon Broadway! Maris is back!